A Euro-disco group producing Caribbean flavoured Christmas carols would usually seem a little odd. Unless of course that Euro-disco group was Boney M.. Christmas Album (also known as Christmas With Boney M.) was released in an attempt to resurrect the group's dwindling sales. The album became a holiday classic and was re-released several times in the late eighties under at least five different titles. 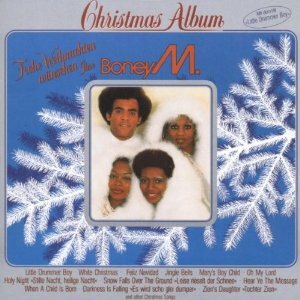 This album’s crowning jewel is Boney M.’s rendition of Mary’s Boy Child. The song was given a reggae feel and sold more than a million copies when it was released in 1978. Today, the group’s cover of this classic is regularly imitated by professional and amateur bands alike. The rest of Christmas Album is an interesting mix of German, French and English carols, all given a curious Calypso flavour. Mid-way through the Jamaican jaunt is the suitably cheesy instrumental Winter Fairy-Tale; horrendously dated nowadays, but great fun nonetheless.